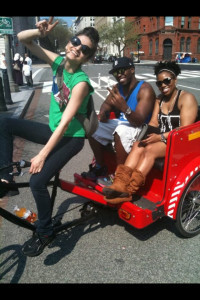 “Loved loved loved my pedicab tour. 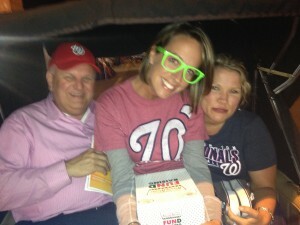 What a fun, unique way to see all parts of DC. Also a great treat for my niece and nephew when they visited. The tours are informative and fun. Our pedicab driver gave us a little childrens book about the presidents and my nephew won’t stop reading it! 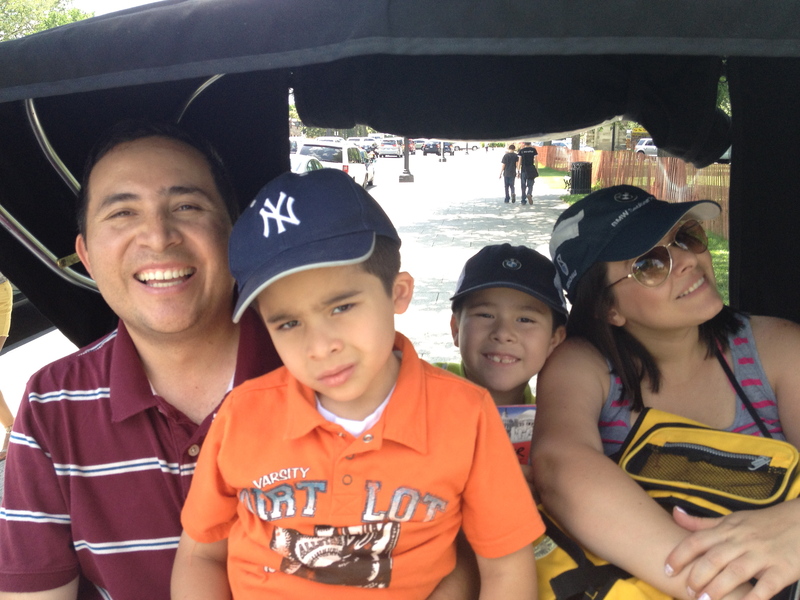 I would highly recommend these tours to anyone.” / Nava B. Just had my grandparents visit and basically resigned myself to a boring day of wandering the mall at a snail’s pace. WRONG!. Grandpa sees a pedicab and has to investigate– long story short the three of us end up on one of the most fascinating tours of DC I’ve ever taken. Our tour guide knew so many interesting facts about DC and even gave us prizes when we knew right answers. My grandma got a miniature American flag for remembering how many columns were around the Lincoln memorial! Our tour guide was so attentive that they still keep talking about going back and seeing him. I can’t remember his name, but I definitely remember the company… And I just found out they have romantic date tours, so you can bet I’ll be calling real soon. -Joseph from Chevy Chase MD. “Had a fantastic time on my Discover DC Tour. The tour guide/owner of the company was awesome. Really funny and amazing person. We were laughing the entire time. To take a tour with her was a great experience. But honestly it was a great way to just take a cab. 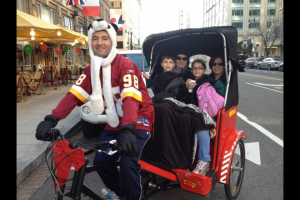 DC is so small and 15 20 minute pedicab ride is a great way to end or start you night.” / Sheri D.
The idea of a pedicab ride never really seemed appealing to me. I barely even knew what pedi-cabbing meant. I remember the first time I even saw a pedicabber in DC a few years ago and wondered when and why such a thing was brought here. I always imagined that aside from the ride being extremely boring, I would find myself distracted the whole time by the overwhelming sense of guilt that I’d feel for the pedi-cabber who I’d assume would be exhausted and in a rush to get the ride over with. That all changed they day I found myself in a penn quarter bar sitting nervously next to a date of mine. The bar seemed to be a local meeting point for a few pedi-cabbers. There, I had the pleasure of bumping into the unprecedented and remarkable individual that is Shaady. I introduced her to my date and it was almost as if she sensed my case of the butterflies. 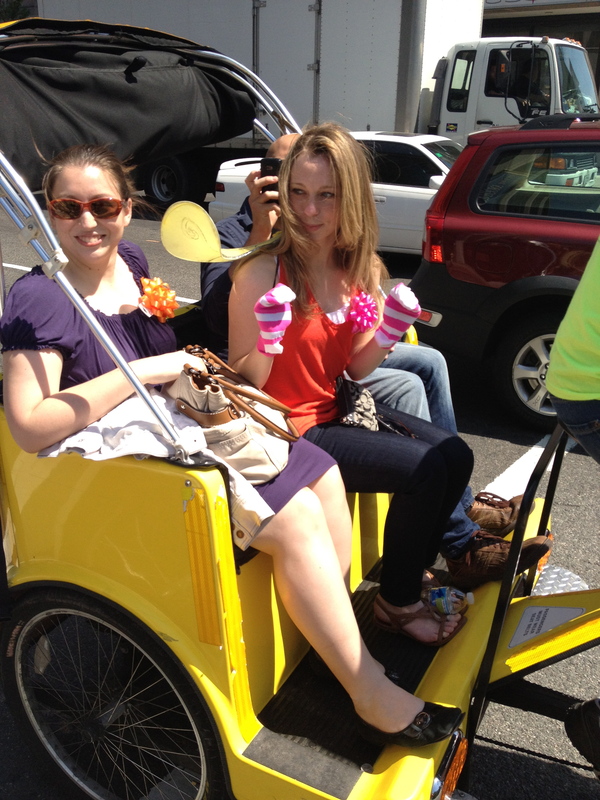 She suggested that she take us on a pedi-cab ride to kill time before our movie started. I was hesitant at first but willing to do just about anything to make the time go by faster. This was perfect. Shaady was so personable and outgoing. I immediately felt at ease. She is entertaining and funny and super knowledgable. Both my date and I had a great time. She rode us around penn quarter, telling us about our surroundings, the nature of her job, and answering any questions we had about the sites we were passing. I must admit, even though I’m a DC native, she knows far more than me. 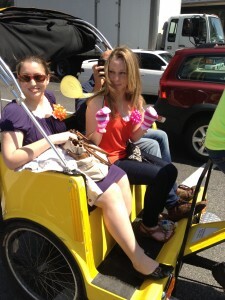 Needless to say, it was an awesome experience and she debunked any and all preconceived notions I had about pedicabbing. She absolutely loves and adores what she does and as a passenger I could feel it. I highly recommend this activity for tourists, and even locals like myself. 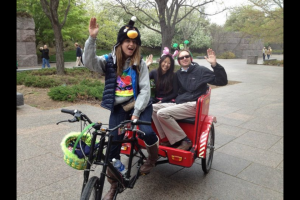 “I’ve had the pleasure of taking a couple Discover DC Pedicab Tours with Madelyn, and I must say not only did she make me feel right at home – she is also extra knowledgeable about the city, professional, and has a sense of humor unlike any other you’ll ever meet! Highly, highly recommended if you want to get a view of DC that you haven’t seen before – as a visitor OR a local!” / Kathy L.